Adventurists in India are a plenty. 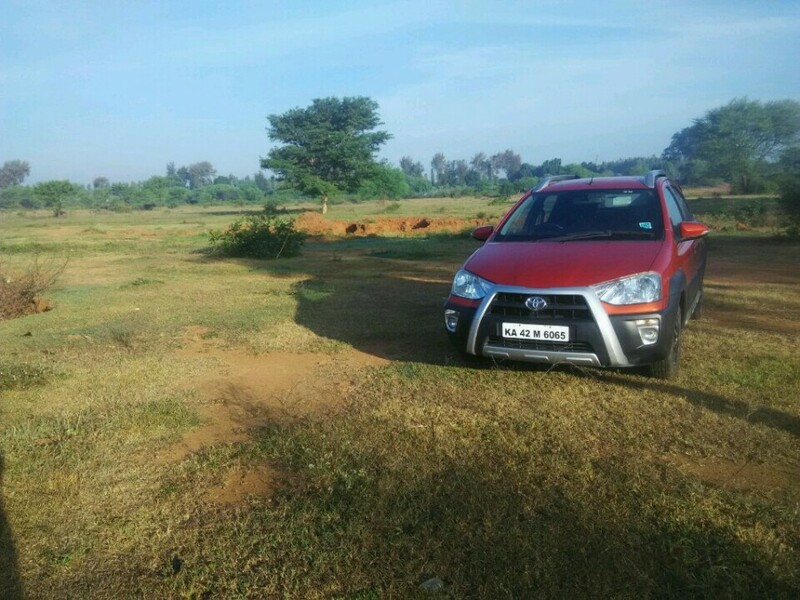 Adventure cars mean SUV’s but India is known to have a great taste in hatchbacks. A mix of these two would make a perfect choice for the adventurists to do what they do with their love for hatchbacks. 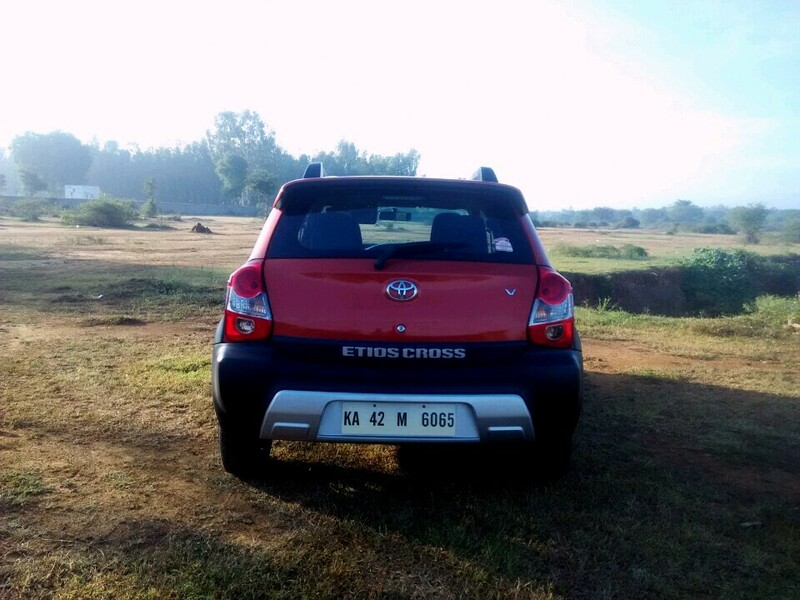 Toyota has read that well and got us the Toyota Etios Cross. 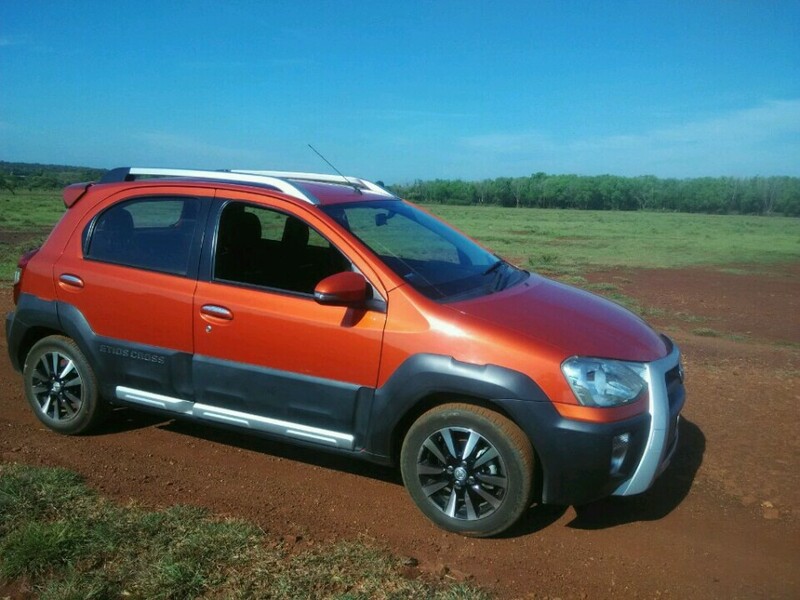 What better way than giving us a macho and a rugged looking Etios Cross. The Cross will be a rival to its European counter part, the Cross Polo and the Fiat Punto based Avventura. 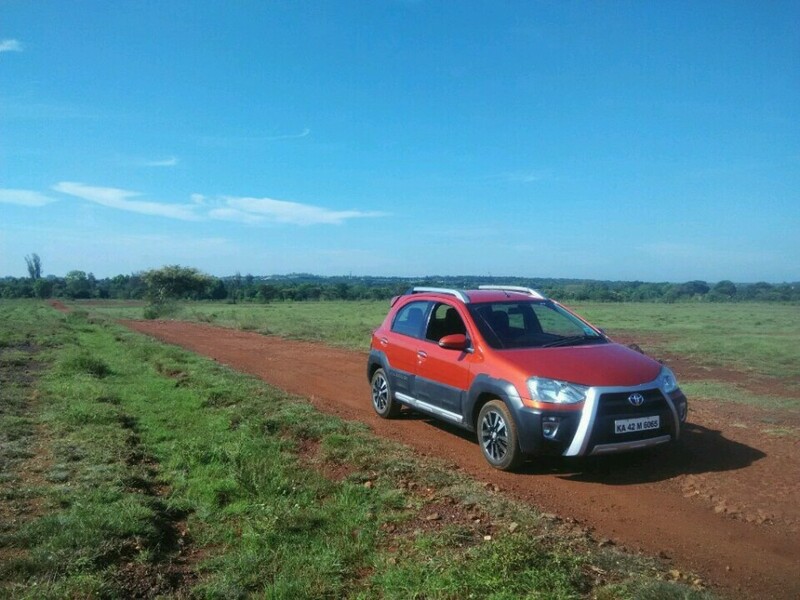 Compact crossovers are becoming a hot favorite in India and Toyota does not like to stay away from it. Etios Cross looks like a beefed up Liva from the outside. 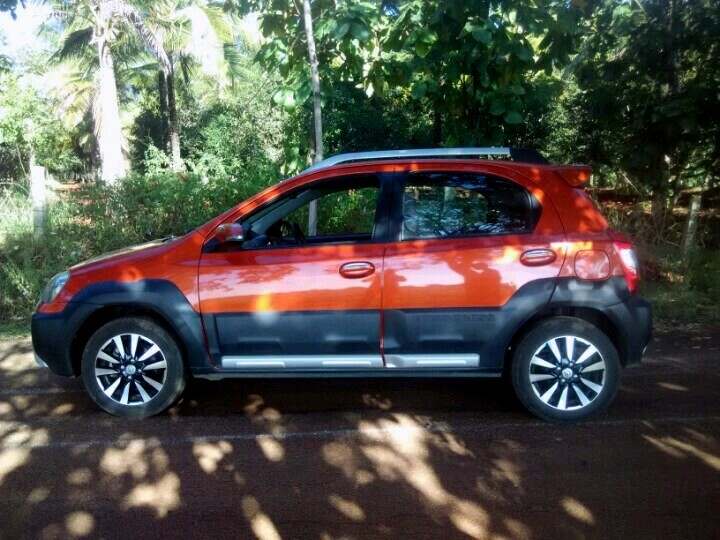 It gets black plastic cladding around its body like the Cross Polo making the Etios Cross look puffed up. The front end of the car gets beefed up bumpers with a Bull bar which gives it a strong presence. Front indicators are placed above the fog lamps housed in the front bumper making it look unique. The headlamps have been extended to meet the Bull bar giving the car a very rugged look. You come to the side of the car and notice the full body black cladding with Etios Cross writing on it. Diamond cut alloy wheels add to the looks of the car. Roof rails are hard to miss and the rear gets a two tone spoiler which enhances the looks of brighter colored cars. 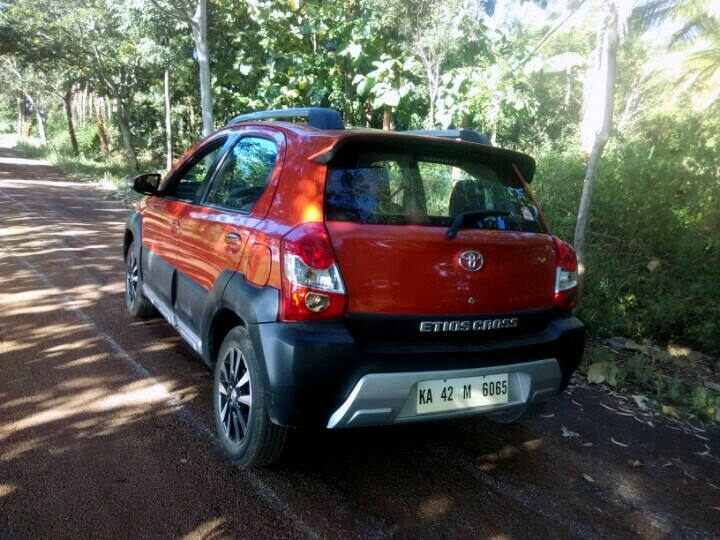 We were lucky enough to get the signature Inferno Orange color of the Etios Cross. 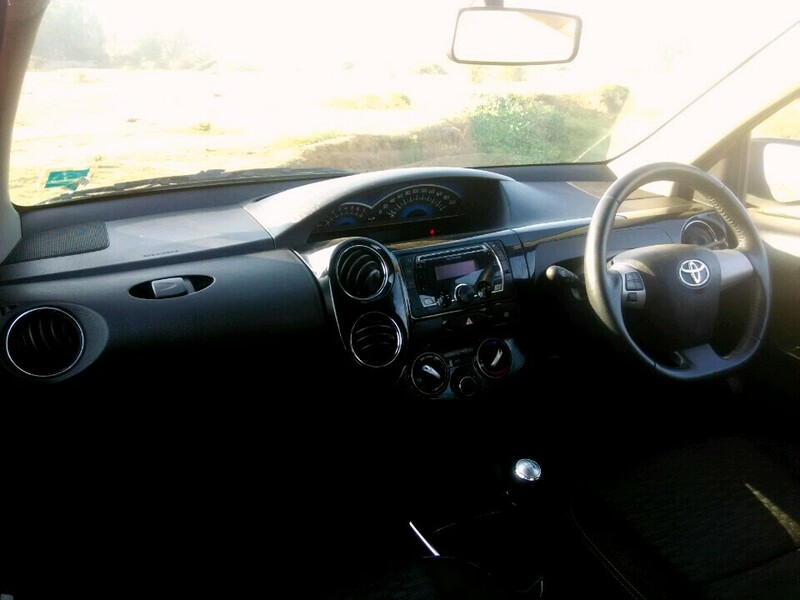 Interiors of the Etios Cross is similar to the Liva’s so there you still get the center mounted speedometer with blue backlight. The Cross houses a double DIN music system with Bluetooth connectivity and steering mounted controls. The air con vents are the same as seen on the Liva. Dash gets a combination of Matte and Glossy black layers making the interiors look sportier. The plastic quality is quite good but we felt Toyota could have improved it to compete against the Cross Polo. Top V spec model gets chrome lining around the air con vents and the gear shift lever. Etios Cross is offered in both petrol and diesel variants. Petrol comes with a 1.2 litre engine giving out 78.8 bhp and 104 Nm of torque, and a 1.5 litre engine making 88.8 bhp of power and 132 Nm of torque. 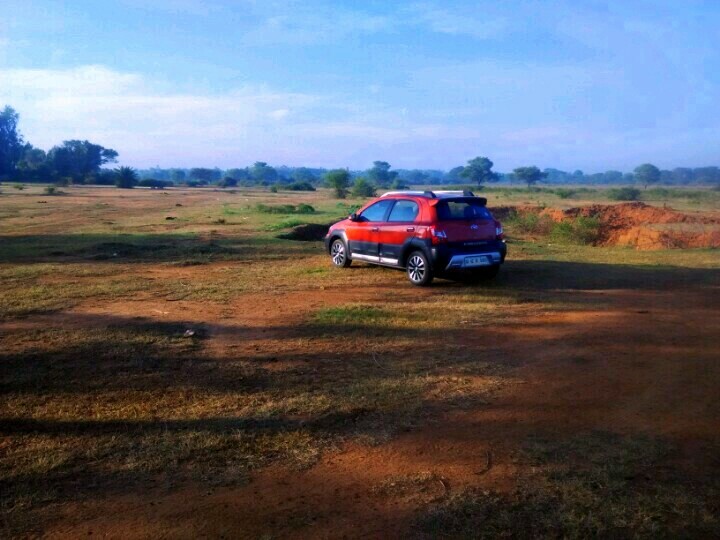 With the diesel Cross you get a 1.4 litre engine producing 67.06 bhp and a good 170 Nm of torque. We got the 1.5 litre petrol engine for the test and i was impressed with it the moment i stepped on the accelerator pedal. The engine gives you good amount of power to cruise at high speeds on the highway. The torque of this motor is more than enough to take you off-roading. The steering feels good and gives you good feedback at low and high speeds. The car gives you confidence to push it around corners and on straight patches. 185/65 R-15 tyres are good enough to let you have fun as and when you feel like. The front end gets a MacPherson strut setup while the rear is a Torsion Beam. Suspension is well damped to give great comfort and minimize body roll. We could manage a top speed of 150km/hr before the road gave up but we were surprised with how ease this car did that. 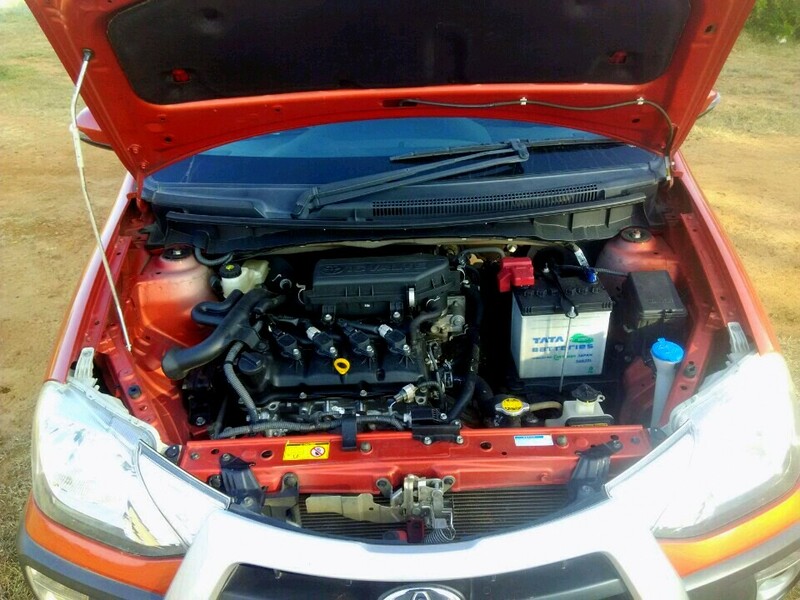 The car comes with a fuel tank capacity of 45 litres, good enough for you to take the car a long distance. Fuel economy on petrol car is around 16.6 kmpl and that of the Diesel is claimed to be 23.5 kmpl. Unfortunately, we couldn’t do much with the car because we got a car with a faulty battery and we had to push the car to start it a few times. Place where Toyota cars excel is the comfort they provide to both the driver and the passengers. The car has a length/width/height of 3895 mm, 1735 mm and 1555 mm respectively. Rear passenger leg room is ample and one would feel comfortable at all times. You get adjustable steering wheel for better driving comfort. Etios Cross gets a boot space of 251 litres which seems good enough to fit all the luggage you need for a weekend drive. 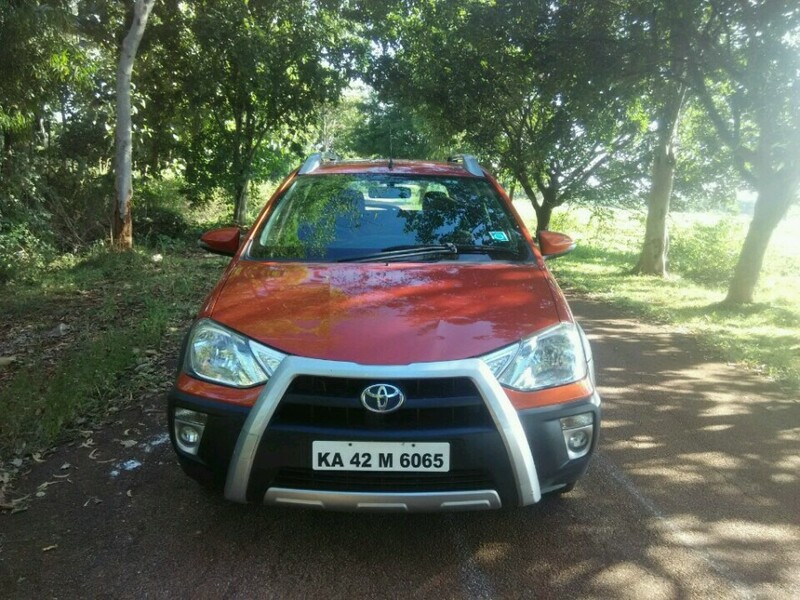 Etios cross comes with dual airbags for the driver and the co driver. To give your Manual those coveted hot looks, there are options of ABS, Central Locking, Passanger Airbag, Driver Airbag, Adjustable Seats & Anti Theft Alarm. Toyota has come to us with a car you would love to enjoy on the roads here in the city as well as the roads outside it. The design is straight forward and the beefed up looks give it a rugged character. 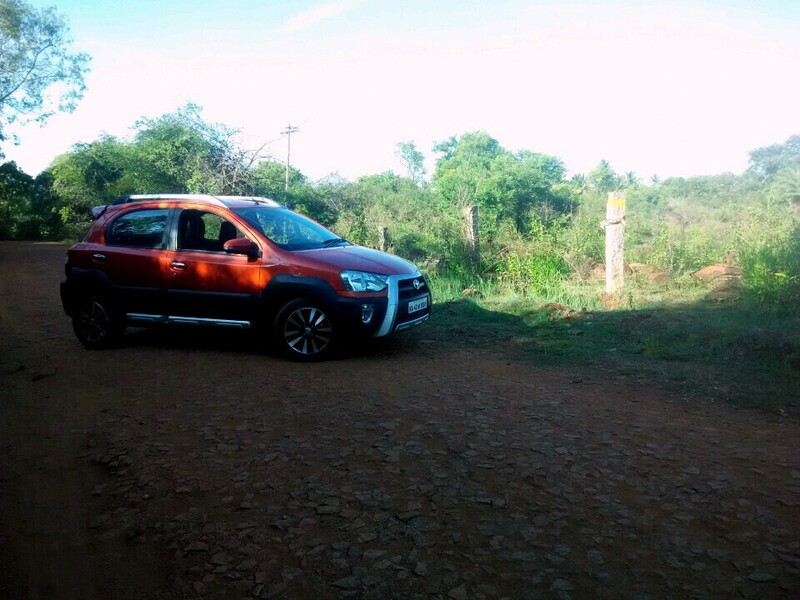 If you are one among them who enjoys going away from the city to lurk around in the wild during the weekend, the Etios Cross will be a perfect companion for you. 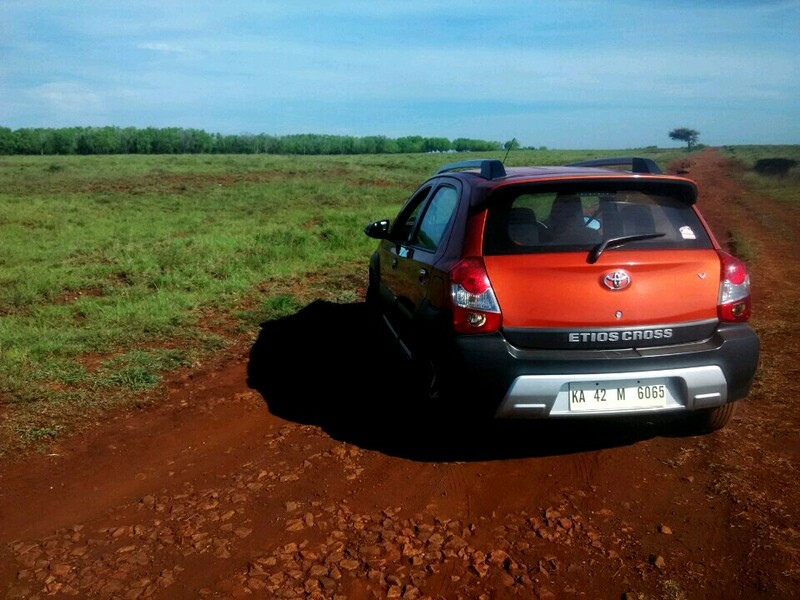 Cross country drives will never be the same again with the Etios Cross. Enhancement in the interiors and the quality would make it a deadly contender against the Cross polo and the Fiat Avventura. But for the price it comes at, its a pretty good deal. 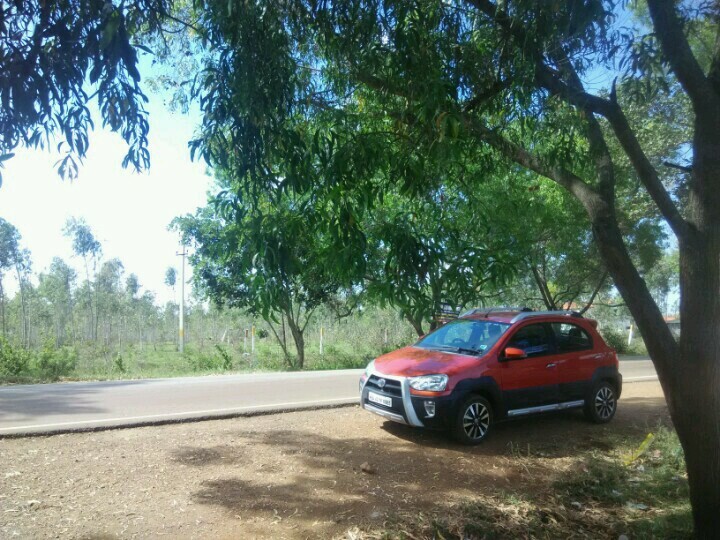 Petrol Etios Cross is available from 6.6 lakh to 8.1 lakh rupees(ex showroom Bangalore) and you could also get the diesel which ranges between 7.77 lakh to 8.07 lakh rupees (ex showroom Bangalore).